Director – Pete Docter, Co-Directors – David Silverman & Lee Unkrich, Screenplay – Dan Gerson, Story – Pete Docter, Jill Culton, Ralph Eggleston, Jeff Pidgeon & Andrew Stanton, Producer – Darla K. Anderson, Music – Randy Newman, Animation Supervisors – Glenn McQueen & Rich Quade, Production Design – Harley Jessup & Rob Pauley. Production Company – Pixar Animation/Disney. In the city of Monstropolis, the Monsters Inc corporation powers the city by sending its monsters through closet doors and then harnessing the energy generated by the screams of children. The top-rating scarer is James P. ‘Sulley’ Sullivan but hot on his trail is Randall who desires to become No. 1. Sulley accidentally comes across Randall trying to harvest extra screams after hours, only to discover that a three year-old girl has wandered through the door and into the complex, something that is believed to carry potentially disastrous consequences. Sulley and his technician Mike Wazowski hide her as a citywide alert goes up from the Child Detection Agency and try to figure out what to do. During the process, Sulley starts to become attached to Boo, as he calls her. However, his attempts to return her are endangered by Randall’s diabolical schemes. Monsters, Inc. was the fourth film to emerge from Pixar Animation and its parent company Disney. Pixar created a revolution in animation with Toy Story (1995), the world’s first fully computer animated feature film, before continuing on with A Bug’s Life (1998) and subsequent to this Finding Nemo (2003), The Incredibles (2004), Cars (2006), Ratatouille (2007), Wall-E (2008), Up (2009), Brave (2012), The Good Dinosaur (2015), Inside Out (2015) and Coco (2017), as well as sequels to many of these. Monsters, Inc. was the first Pixar film to not have been directed by company founder and principal creative force John Lasseter. It was instead turned over to Pete Docter, who worked on the stories for both Toy Story films and was a supervising animator on the first, and would go on to subsequently make Up. With each film, Pixar have pushed new artistic boundaries in terms of sophistication of the form. Indeed, with each computer animated film from Pixar and other companies since Toy Story, it seemed as though there was an ongoing competition to push new boundaries of realism. The same year as Monsters, Inc. alone, Pixar faced heavy competition in the computer animation stakes from DreamWorks’ Shrek (2001), although both were outstripped by the amazing degree of photo-realism in the sadly underappreciated Final Fantasy: The Spirits Within (2001). Certainly, Pixar show off technically and artistically here. Monsters, Inc. is worth watching for the technical skill that has gone into texturing the various leathery, slimy and reptilian skins of the monster characters, or giving a weatherbeaten look to the tiles in the bathroom and the cement in the basement. The way every hair of Sulley’s fur individually ripples with his snores when we first see him is dazzling in its detail. The backgrounds come with incredible detail – if it was possible to freeze-frame the cinematic image one can read the paperwork handed to Mike, the stories on Roz’s tabloid newspaper or the individual items on the menu in the restaurant. Contrast this to the relatively blank backgrounds in Toy Story and one can see exactly what quantum leaps in technical sophistication that Pixar have made. Of course, a film that is merely a showoff in technical pseudo-realism is a dry academic exercise. Happily, as with most of Pixar’s product, Monsters, Inc. can also be appreciated for its sheer unabashed fun. The film has so much visual invention going on in the background and foreground that it is a constant delight. Few other films move with such cruisy pace as this does. Monsters, Inc. gets the humour and the cuteness down just right. The relationship between Sulley and the three year-old girl running about calling him “Kitty” is surely one of the cutest and most delightful thing you will see on a screen. The secret life of monsters in the closet was first done in the also appealing live-action film Little Monsters (1989) – and, of course, both films hold lineage to the children’s tales of Maurice Sendak. 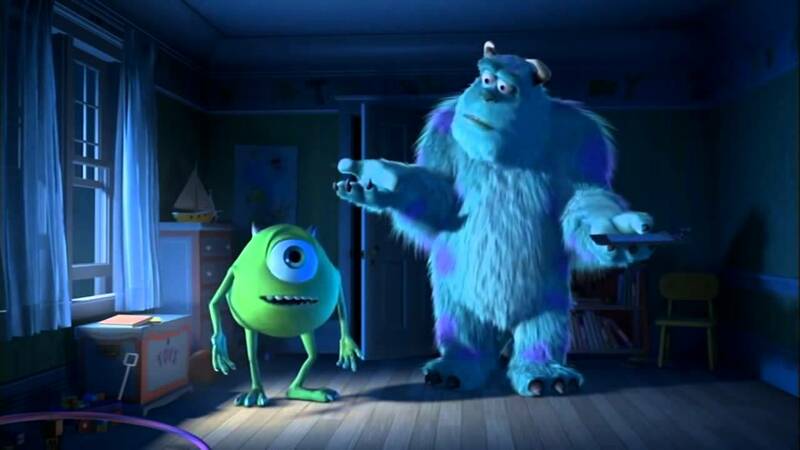 When it comes down to it, Monsters, Inc. is a Sendakian film. Of course, being a Disney film, the monsters are never that scary or macabre, they are all big and cuddly. The masterpiece that got the Sendakian sense of the macabre right was Henry Selick’s The Nightmare Before Christmas (1993). Spike Jonze subsequently made a live-action adaptation of Maurice Sendak’s Where the Wild Things Are (2009). The film was theatrically rereleased in 3D in 2012. Pixar made a sequel with Monsters University (2013). (Winner in this site’s Top 10 Films of 2001 list. No. 4 on the SF, Horror & Fantasy Box-Office Top 10 of 2001 list).